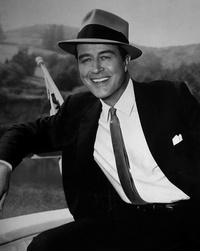 Ray Milland (3 January 1907 – 10 March 1986) was a Welsh-born, British and American actor and director. His screen career ran from 1929 to 1985, and he is best remembered for his Academy Award"winning portrayal of an alcoholic writer in The Lost Weekend (1945), a sophisticated leading man opposite a corrupt John Wayne in Reap the Wild Wind (1942), the murder-plotting husband in Dial M for Murder (1954), and as Oliver Barrett III in Love Story (1970). This webpage uses material from the Wikipedia article "Ray_Milland" and is licensed under the GNU Free Documentation License. Reality TV World is not responsible for any errors or omissions the Wikipedia article may contain.